This is a narrow, space-saving and sturdy steel mobile computer workstation with pull-out keyboard, designed to fit in small tight spaces. The upper shelf is adjustable, making this the ideal height adjustable computer desk, adjustable in 2" increments, from 24" to 42" total height. The headroom of the bottom shelf is 14 3/4. This item is also available as a lockable cabinet (C AVJ42KBC) and with bigger wheels (5" C5i). Please call for special configuration details. Also available with 26" , 34" and 42" fixed heights, without keyboard, etc... Contact us with your questions. - Includes 3-outlet power cord, 15' UL and CSA electric assembly. - Rolls on large 4" casters, two with locking brakes. - Colors: black, green, red, yellow, or blue. * Many Options! 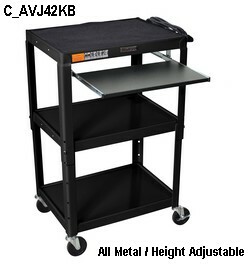 This line is also available with the following options: a) large 8" Wheels on one end plus UL Listed safety strap (C AVJ42B); b) Cabinet (C AVJ42C, as explained and pictured above); c) Lower heights: 34 or 26"; expandable width w/foldable side shelves (C AVJ42KBDL), etc..